« ‘Now, A Trade War; Next A Shooting War?’ USA-UK dividing from EU-Russia? USA to fight North Korea? Biltz argues this refers to the world being struck by an extraplanetary object and argues the last days will be marked by strange events in the heavens. While the Bible talks about heavenly signs (e.g. Matthew 24:29-30; Revelation 6;12) and the USA needs to change (repent), Mark Biltz has often misunderstood natural astronomical occurrences. The truth is that Mark Biltz’s false prophecies about “blood moons” did not rock the Christian world, though various Protestants were misled by him. In 2014 and 2015, I denounced various non-biblical blood moon theories, including claims made by Mark Biltz (see Blood Moons and Prophecy). He was proven wrong, and I was proven right about this. In 2016, I denounced the view from another that asteroid Bennu would destroy the world (see ABC warned about Asteroid Bennu potentially destroying the Earth). I also denounced the idea of some that the Earth could be destroyed by Planet Niburu by 2017 (watch Planet Nibiru to Destroy Earth by 2017?). However, it is true that something from space, probably an asteroid or a comet, is prophesied in the Bible to hit the Earth and cause massive damage (Revelation 8:10-11). A large comet hitting the earth would also seem to have similar effects to that of a medium-sized asteroid. And having something actually hit the earth and do massive damage is predicted in the Bible. But this object, called Wormwood in the Bible, cannot hit for some time. 1 When He opened the seventh seal, there was silence in heaven for about half an hour. 2 And I saw the seven angels who stand before God, and to them were given seven trumpets. 3 Then another angel, having a golden censer, came and stood at the altar. He was given much incense, that he should offer it with the prayers of all the saints upon the golden altar which was before the throne. 4 And the smoke of the incense, with the prayers of the saints, ascended before God from the angel’s hand. 5 Then the angel took the censer, filled it with fire from the altar, and threw it to the earth. And there were noises, thunderings, lightnings, and an earthquake. It should also be noted that there are MANY EVENTS that also have to take place before the above events as well. Because of that, it is biblically impossible for the Earth to be destroyed by something from space for years. Notice that Wormwood does not fall until after the third trumpet associated with the seventh seal of Revelation is blown. Well, this would mean that the fifth and sixth seal would also have already been opened–which are mentioned in Revelation 6:7-17, and the 144,000 numbered as shown in Revelation 7. And I should add that the fifth seal of Revelation cannot possibly be opened for at least 3 1/2 years from now (see When Will the Great Tribulation Begin? ), with over 4 years the likely minimum. Wormwood does exist–but again Wormwood cannot hit for several years at the earliest. That does not mean that there cannot be any problems from meteorites, comets, asteroids, solar flares, etc. But it does mean that this age will not end for at least several years. Why bother to post about the Asteroid Apophis prediction? Well, before answering that, let me state that there is a certain irony about this asteroid. 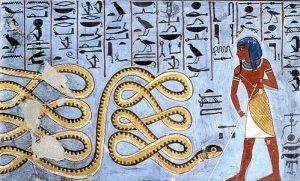 It is named after the Egyptian snake god of chaos. I believe that those who falsely promoted “blood moons” were like sellers of chaotic snake oil. Hence the photo at the beginning of this post. Now, with the massive solar eclipse expected on August 21, 2017, various ones are concerned about it. Mark Biltz has misled people about it. But the Bible does not call the world the sun nor Israel the moon. Nor are solar eclipses referred to in Genesis 1:14–Jeremiah 10:2 warns against interpreting all astronomical events as coming from God. Elul is the 6th month in the Hebrew calendar, it usually begins in August, but never in April. Two constellations that astrologers refer to appearing close is supposed to be a fulfillment of Revelation 12:1-2? Preposterous! WND promotes him, but Mark Biltz has been wrong. He misled many about the “blood moons” a couple of years ago (see also WND continues to promote Mark Biltz’ blood moon nonsense) and this particular solar eclipse should not be considered a sign from God. So, before the eclipse occurs, I again want to inform people that this eclipse is a natural phenomenon and not anything that is a direct sign from God like Mark Biltz implies. Some even believe this eclipse, based on some of the same scriptures that Mark Biltz relied on, is the end of the world (see World to End August 21, 2017?). But it is not. Therefore, because there are many false and heretical leaders that lead people astray on prophecy and sometimes they mention the Bible to try to act like God sanctions their nonsense, they should be denounced as false. Thus, you can be certain that the upcoming solar eclipse will NOT destroy the Earth this month. Solar Eclipse and the Apocalypse According to NASA scientists, a massive solar eclipse is to occur on August 21, 2017. Some claim that it is apocalyptic and they will be raptured then. Mark Biltz, of ‘blood moon’ fame, citing Genesis 1:14, says this is a sign of God for national repentance. Is it? Could Jeremiah 10:2 apply here? Mark Biltz and others tie this August 2017 solar eclipse in with Revelation 12–is that possible? Is there any solar eclipse associated with the Apocalypse? If so, when is the soonest that prophecy can be fulfilled? Going through biblical passages, including the words of Jesus, Dr. Thiel provides answer to those questions. This is a video. Will the Great Tribulation Start in 2017? There are various theories, signs, and opinions of ones who believe that the Great Tribulation will start in 2017. Some point to Nostradamus, some point to Fatima, some point to a solar eclipse for 21 August 2017, some point to Donald Trump, some point to Jubilee cycles, some point to the rebirth of the nation of Israel, some point to a possible Shemitah year, some point to a Jewish sage, others point to the Bible, and some claim a combination of reasons why the Bible supports their view that the tribulation will begin in 2017. Is it at all possible for the Great Tribulation to begin in 2017? Dr. Thiel goes over various theories and shows what the Bible actually teaches. This is a video. Is the Universe Expanding or about to Catastrophically Collapse? A study released by NASA in June 2016 indicates that the universe is expanding much more rapidly than scientists have believed. Prior to this study, certain Danish scientists stated that the universe was going to collapse, and could as quickly as any day. What does the Bible teach? Is a collapse of the universe possible? Does God have a plan for the universe? Might you have a part in it? This is a video. Blood Moons, Eclipses, and Prophecy There were four ‘blood moons’ expected in 2014 and 2015. Some claimed that they signaled the Day of the Lord or the return of Jesus Christ. I denounced that view in advance. Now some point to a solar eclipse in 2017–is that a ‘sign from God’? A YouTube video is also available: Blood Moons, Prophecy, 2014, and 2015. When Will the Great Tribulation Begin? 2017, 2018, or 2019? Can the Great Tribulation begin today? What happens before the Great Tribulation in the “beginning of sorrows”? What happens in the Great Tribulation and the Day of the Lord? Is this the time of the Gentiles? When is the earliest that the Great Tribulation can begin? What is the Day of the Lord? Who are the 144,000? Here is a version of the article in the Spanish language: ¿Puede comenzar la Gran Tribulación en 2016 o 2017? ¿Es el Tiempo de los Gentiles? You can also see the English language sermon videos: The Great Tribulation from the Mount of Olives and Can the Great Tribulation begin before 2020. This entry was posted on Wednesday, August 9th, 2017 at 12:01 am	and is filed under Religious News.